Aren’t Triangle Quilts AMAZING? Have you been stalking Triangle Quilt Pinterest Boards hoping someday you will make one of your own? Are you afraid of the seams? Does the thought of matching points make you nervous to create a quilt of your very own? Well, we’ve got you covered in our Triangle Quilt Class! Our Triangle Baby Quilt class walks you through step-by-step from picking out your fabric to finishing your quilt. 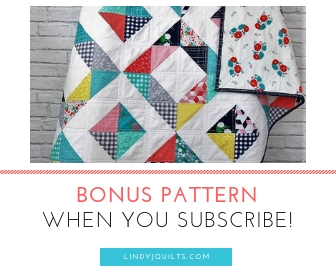 You’ll learn how to cut the triangles, sew them together, baste + quilt, and finish the quilt with machine-stitched binding. This class is perfect for you if you’re new to quilting and even if you’re a seasoned pro! Learn at your own pace. Stop and rewind parts that need more attention. Have fun watching me and mom work together to get you your very own Triangle Baby Quilt! Our class is hosted by Skillshare and we LOVE them! What is Skillshare? It’s a huge collaboration of all kinds of teachers and industries. At a low monthly subscription, you have access to so many online courses – including our Triangle Baby Quilt Class! But we have to warn you, Triangle Quilts are addictive! You may find yourself making several once you learn all the steps we teach you.